The human body has a complex system of muscular reflexes, developed and evolved to protect us from injury. Reflexes are designed to trigger reactions in our muscles, to protect us against impacts. This muscular response is obvious in our legs, but is also at hand in our arms, torsos and necks. When muscles react to impact, they contract – to serve as shock absorbers – and to stabilise the spine and joints. The terms Whole Body Vibration describes a phenomenon, which is present in trucks, trains, cars, boats, ships and other vehicles. The term is aimed at describing vibration, caused by engines, wheels etc. 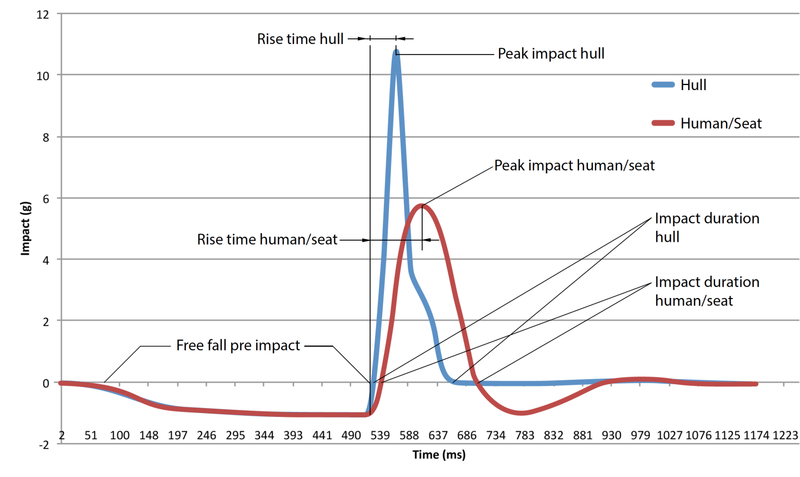 The events that occur when RIB boats, RHIBs and other high-speed craft impact with water after free fall are better described as Human Impact Exposure. Shock Mitigation is used mainly in the United Stated, also when actually describing Human Impact Exposure.